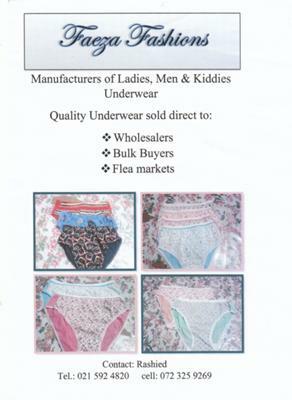 We are an underwear manufacturing company that specializes in kiddies, women and men's underwear. We sell direct to wholesalers, bulk buyers and flea markets. You can also send an email to faezas.fashion@gmail.com. Please note that prices will be discussed when you contact us.